Before oil barons brought wealth and fame to the region, Tulsa defined itself by cultural sophistication. Replacing the citys first 2,700-seat municipal theater, erected in 1914, the Tulsa Performing Arts Center opened its doors in March 1977 with a performance by the legendary first lady of jazz Ella Fitzgerald. The Tulsa Performing Arts Center was constructed using a combination of public and private funds and is owned and operated by the City of Tulsa. Occupying a half city block in Tulsa's historic downtown, the Tulsa PAC is the design of Minoru Yamasaki, architect of the World Trade Center towers. The Centers largest theater is Chapman Music Hall, seating 2,365. It is home to Celebrity Attractions touring Broadway series. Tulsa is fortunate to boast the 60-year old Tulsa Opera, and the equally and internationally famous 51-year old Tulsa Ballet, which perform at the Tulsa PAC along with the Tulsa Symphony Orchestra. The Center has 10 other resident organizations that present entertainment in Chapman Music Hall, in the 430-fixed-seat John H. Williams Theatre and two black box theatres. In addition, a studio space, an art gallery and a large reception hall offer many event options. Recent big-name events at the PAC include Monty Pythons Spamalot, Chicago, The Lion King, Michael Bublé, Chris Botti, Lily Tomlin, Nora Jones and speakers Ken Burns and Bob Schieffer. Arts patrons come to the PAC year round to attend a performance from one of Tulsa's acclaimed arts groups, to sample national and international talent, to stage or attend various social functions or Art Gallery exhibits and to view the PAC's extensive collection of art. The element that unites all spaces at the Tulsa Performing Arts Center is art  a collection of 76 pieces: art overhead, on the grounds, along the corridors and in the lobbies. The PAC's permanent art collection boasts famous Oklahoma artists like Alexandre Hogue, a large sampling of Native American art, and such art superstars as Britains Dame Barbara Hepworth, Dutch artist Karel Appel, Russian artists Louise Nevelson and Ilya Bolotowsky, Hungary's Gabor Peterdi and Germany's Wolf Kahn. Before oil barons brought wealth and fame to the region, Tulsa defined itself by cultural sophistication. Replacing the city's first 2,700-seat municipal theater, erected in 1914, the Tulsa Performing Arts Center opened its doors in March 1977 with a performance by the legendary first lady of jazz Ella Fitzgerald. The Tulsa Performing Arts Center was constructed using a combination of public and private funds and is owned and operated by the City of Tulsa. Occupying a half city block in Tulsa's historic downtown, the Tulsa PAC is the design of Minoru Yamasaki, architect of the World Trade Center towers. The Center's largest theater is Chapman Music Hall, seating 2,365. It is home to Celebrity Attractions' touring Broadway series. Tulsa is fortunate to boast the 60-year old Tulsa Opera, and the equally and internationally famous 51-year old Tulsa Ballet, which perform at the Tulsa PAC along with the Tulsa Symphony Orchestra. 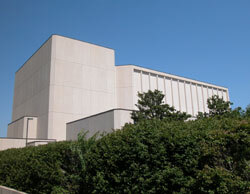 The Center has 10 other "resident" organizations that present entertainment in Chapman Music Hall, in the 430-fixed-seat John H. Williams Theatre and two black box theatres. In addition, a studio space, an art gallery and a large reception hall offer many event options. Recent big-name events at the PAC include Monty Python's Spamalot, Chicago, The Lion King, Michael Bublé, Chris Botti, Lily Tomlin, Nora Jones and speakers Ken Burns and Bob Schieffer. Arts patrons come to the PAC year round to attend a performance from one of Tulsa's acclaimed arts groups, to sample national and international talent, to stage or attend various social functions or Art Gallery exhibits and to view the PAC's extensive collection of art. The element that unites all spaces at the Tulsa Performing Arts Center is art  a collection of 76 pieces: art overhead, on the grounds, along the corridors and in the Before oil barons brought wealth and fame to the region, Tulsa defined itself by cultural sophistication. Replacing the city's first 2,700-seat municipal theater, erected in 1914, the Tulsa Performing Arts Center opened its doors in March 1977 with a performance by the legendary first lady of jazz Ella Fitzgerald. The Tulsa Performing Arts Center was constructed using a combination of public and private funds and is owned and operated by the City of Tulsa. Occupying a half city block in Tulsa's historic downtown, the Tulsa PAC is the design of Minoru Yamasaki, architect of the World Trade Center towers. The Center's largest theater is Chapman Music Hall, seating 2,365. It is home to Celebrity Attractions' touring Broadway series. Tulsa is fortunate to boast the 60-year old Tulsa Opera, and the equally and internationally famous 51-year old Tulsa Ballet, which perform at the Tulsa PAC along with the Tulsa Symphony Orchestra. The Center has 10 other "resident" organizations that present entertainment in Chapman Music Hall, in the 430-fixed-seat John H. Williams Theatre and two black box theatres. In addition, a studio space, an art gallery and a large reception hall offer many event options. Recent big-name events at the PAC include Monty Python's Spamalot, Chicago, The Lion King, Michael Bublé, Chris Botti, Lily Tomlin, Nora Jones and speakers Ken Burns and Bob Schieffer. Arts patrons come to the PAC year round to attend a performance from one of Tulsa's acclaimed arts groups, to sample national and international talent, to stage or attend various social functions or Art Gallery exhibits and to view the PAC's extensive collection of art. The element that unites all spaces at the Tulsa Performing Arts Center is art  a collection of 76 pieces: art overhead, on the grounds, along the corridors and in the lobbies. The PAC's permanent art collection boasts famous Oklahoma artists like Alexandre Hogue, a large sampling of Native American art, and such art superstars as Britain's Dame Barbara Hepworth, Dutch artist Karel Appel, Russian artists Louise Nevelson and Ilya Bolotowsky, Hungary's Gabor Peterdi and Germany's Wolf Kahn. An attractive, comfortable setting, a knowledgeable staff and superb entertainment create the gratifying experience that audiences and performers enjoy when they "Come Home to the Arts" at the Tulsa Performing Arts Center. An attractive, comfortable setting, a knowledgeable staff and superb entertainment create the gratifying experience that audiences and performers enjoy when they "Come Home to the Arts" at the Tulsa Performing Arts Center.